If you intend to visit Cheltenham, please call the Tourism Office at The Wilson in Clarence Street on 01242 237431 and let us know. Where possible we will offer a free meet and greet service if requested in advance. 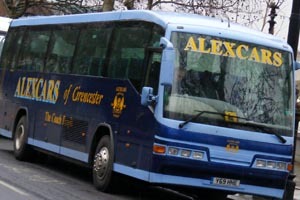 Other arrangements can be made for coach parking at Cheltenham Town Football Club (fees apply and pre-booking is essential) by contacting them directly at accounts@ctfc.com. During the busy Christmas market period 29 November to 20 December we would ask drivers to use the bus station for drop off and pick up only and to be aware not to block bus stops which are reserved for local scheduled bus services. The postcode for Royal Well is GL50 9SA. Please drop off and pick up in bays 1 to 4 and limit this to 15 minutes during busy periods such Cheltenham Festival raceweek and the Christmas market. During quieter periods, out of town visiting coaches may stay in bays 1 to 4 for longer periods on a first come first served basis. Many thanks for your co-operation with these arrangements and we look forward to welcoming you to Cheltenham!